So another disappointing summer comes to an end and we move into the third quarter of the year. Autumn is a very special if not the best season of the year, as the atmosphere created by nature calms down and plant growth begins to slow leading to beautiful autumn leaf colours and fruits and berries ripening bringing a totally different look and feel to the garden. There are many ‘specialist’ autumn plants which can provide colour specifically for this time of year. Rudbeckia, Helenium, Aster, Sedum. Crocosmia, Schizostylis, Trycirtis to name a few. Add shrubs such as Hypericum, Hydrangea paniculata, Perovskia, Ceratostigma and Caryopteris for more autumn flower and it becomes apparent that there is much to see yet. The fiery leaves of deciduous shrubs and trees are what our autumn are all about and Japanese Maples probably top the list with their wide variety and options for all gardens, but there are many options including Prunus species, Euonymus, deciduous Azaleas, Amelanchier and many more. Gardening though is all about planning ahead and if you want colour during the winter you need to be planting now, because if plants have established before the winter then they will perform much better. Pots and baskets for winter colour should really be planted this month for the best results. Look out for Chrysanthemums, Cyclamen, Pansies/Violas, winter Heathers and evergreen foliage plants to add balance. Also you can add dwarf bulbs for early spring colour. Bulbs need planting for next spring, don’t wait too long, plant them early! 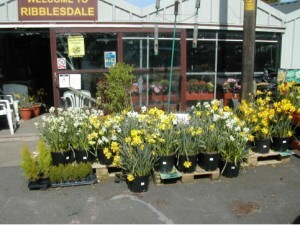 Snowdrops, Crocuses, Narcissi, Tulips etc. DO IT NOW!! Wallflowers are becoming popular again and if you want these beautifully scented flowers next spring, you need to plant them now and allow them to establish over the winter. Gardens can be exciting and colourful throughout the year, not just in the spring and summer. Make the most of any settled and fine weather during autumn and add to the delights of you own garden to enhance you autumn and winter – to help get you through the inevitably dark days.